This week Delacorte editor Françoise Bui told me that a copy editor's working on Secret Keeper (Random House, Spring 2009), the flap copy and author bio are good to go, and she's sending me cover art soon. I've got one more revision of The Bamboo People due to Charlesbridge, but that feels more than manageable. And agent Laura Rennert called to chat about future projects. After almost three years of writing under contract, I'm free! 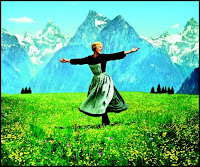 Picture me on the Austrian Alps -- wait scratch that, the Himalayan foothills -- singing and whirling with arms akimbo. My goal for the next three years? Hone the craft, sweetheart, and no signing on a dotted line before that first draft is finished.